There’s so much more to discover about the newly designed and revamped 2017 Audi A6. So, head down to your local Glenmore Audi dealer today to speak to one of our experts about this fabulous vehicle and all it has to offer. Few cars on the road today exude the type of class, elegance and sophistication that the 2017 Audi A6 does. From its luxuriously sporty exterior to its luxurious, well thought out and spacious interior, the newly designed 2017 Audi A6 has an all-in-one fabulously designed and engineered package that’s also a complete and utter joy to drive. Let’s start with the exterior design. From nose to tail, the 2017 Audi A6 simply oozes luxury and upper class. The all-new and emphasized horizontal front grille makes a serious statement on the road, as does do the re-engineered headlights. The A6’s carefully designed bumpers, air intakes, side sills, exhaust tips and taillights only add to its overall look and make it instantly recognizable on the road as a formidable player in the luxury automotive world. Inside that same level of sophistication and elegance resides in a cockpit that’s as functional as it is welcoming. Navigate Audi’s onboard entertainment and navigation system via the MMI touch pad that lets you “write” what you’re looking for via a touch-sensitive pad. Integrated Bluetooth along with 8-way power adjustable front seats ensure creature comforts are answered up front. 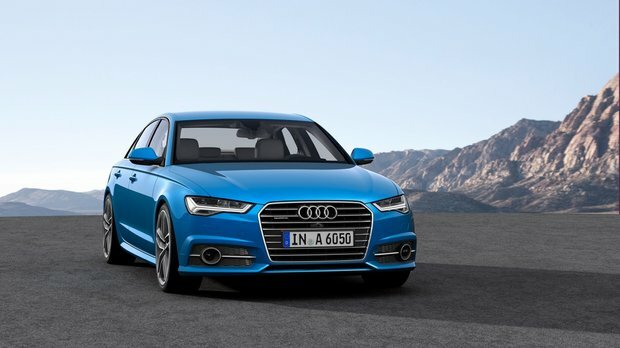 Now, the 2017 Audi A6 is about more than looking like a gentleman on the road. This luxury sedan’s got more than just good looks going for it. Slip behind the wheel of an A6 equipped with the 2.0L TFSI and you’ll have a fabulous 252 horsepower and 272 lb-ft of torque at your fingertips and feet (coupled with a Tiptronic automatic transmission for optimal drivability). Opt for the Audi A6 Competition version and your luxury sedan comes equipped with a 3.0L TFSI that pushes out 340 horsepower and 325 lb-ft of torque. Zero to 100 km/h happens in just 5.2 seconds and top speed sits at 209 km/h. This isn’t just a gentleman’s ride. Trust us. And that’s the really beauty of the 2017 Audi A6 sedan; it might look for all intents and purposes to be a subdued, humdrum luxury automobile to cart businessmen from one meeting to the next in city centres, but this rocket of a car can just as easily handle itself on a track with fantastic Quattro all-wheel drive, 5-link front suspension (Competition trim), and electromechanical steering with speed-sensitive power assistance (also Competition trim). There’s so much more to discover about the newly designed and revamped 2017 Audi A6. So, head down to your local Glenmore Audi dealer today to speak to one of our experts about this fabulous vehicle and all it has to offer. We promise you won’t be disappointed. And don’t forget to book a test drive, too.